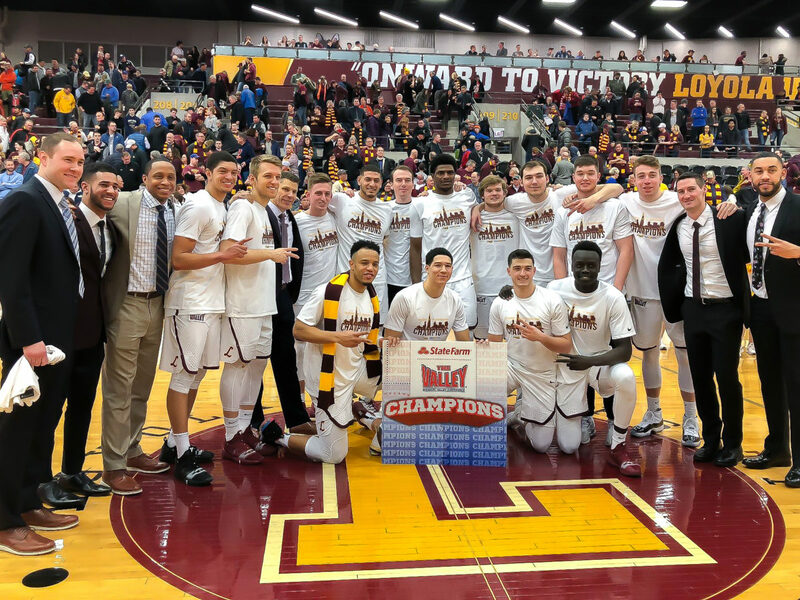 Abby Schnable | The Phoenix The Loyola men's basketball team received an automatic bid to the NIT after winning the MVC regular season title. Four Loyola men’s basketball players received All-Missouri Valley Conference (MVC) honors — including two first team All-MVC nominees, the league announced Tuesday morning. Fifteen players from across the MVC were named to three respective All-MVC teams. 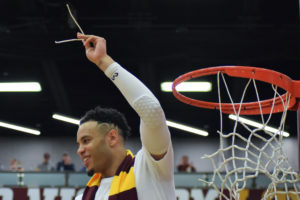 Loyola redshirt senior guard Marques Townes and sophomore center Cameron Krutwig were both named first team All-MVC, meaning they were voted among the top five players in the conference. They both had impressive seasons and scored 52.4 percent of the Ramblers’ points in conference play. Redshirt senior guard Clayton Custer was also named third team All-MVC after taking home the Larry Bird Player of the Year trophy last season. Rounding out Loyola’s all-conference honors was first-year guard Cooper Kaifes, who was named to the MVC All-Freshman Team after splitting time in the starting lineup and off the bench for the Ramblers. Townes, a candidate for this year’s MVC Player of the Year, stepped up into a leadership role in his second season for the Ramblers. The Edison, New Jersey native averaged 15.9 points per game while also leading the team in assists with 3.5 per game. Krutwig improved on an impressive first-year season in which he took home the MVC Freshman of the Year award, as he also received consideration for MVC Player of the Year. The big fella finished the regular season averaging 14.9 points per game while also snagging 7.3 rebounds per contest. Following up on his Player of the Year season, Custer has struggled at times this year to return to the form that made him The Valley’s best player. The redshirt senior finished his final regular season averaging 11.4 points per game while shooting 37.1 percent from three. Kaifes finished this season averaging 5.6 points per game while shooting 45.7 percent from three-point territory, with 48 of his 57 made field goals coming from long range. The Ramblers are scheduled to open Arch Madness March 8 at noon against the winner of the No. 8 seed Indiana State University vs. No. 9 seed Valparaiso University game March 7 at 6 p.m.